Demian Chapman walked through the streets of Hong Kong overwhelmed by the smell of shark meat for sale. Shop after shop was overflowing with fins from species unknown. The marine biologist knew many were sustainably fished. He suspected others were from endangered species on the brink of extinction. It made him angry. It made him sick. That was in September 2013, right before the Convention on International Trade in Endangered Species (CITES) was set to convene in Bangkok. There, nations would decide whether to regulate the fins and other products of five commercially important shark species. Chapman was on his way to Bangkok but stopped in Hong Kong — the shark fin capital of the world — to help establish a monitoring program to determine how many shark species were in the local fin trade. He then set his sights on CITES and was part of a team that successfully pushed for all five species on the agenda to be listed for regulation. This means exporters are now required to have permits to trade them. The monitoring program Chapman developed with local officials in Hong Kong has been key to enforcing these directives. While many thought shark conservation in Hong Kong would be impossible, Chapman said conservation efforts have improved there. Knowing when a shark product is from a protected species and when it is not can be a major challenge — many fins look alike. Chapman has spent his career trying to make fins more identifiable, a critical step in stopping the illegal fishing of endangered species. He is the co-developer of a guide and iPhone app that help fishermen and enforcement officials quickly and easily identify fins of protected species. He also conducts DNA testing and is working with border patrol in Hong Kong to develop more portable methods for in-the-field identification. He even does DNA testing in the markets to track how CITES actually works for the species it protects. A native of New Zealand, Chapman is the latest addition to a growing team at FIU dedicated to the study and protection of large marine predators. The researchers have come from all across the world — South Africa, Europe, China and North America — to form a research hub in South Florida. They are unified in a single mission: to protect, conserve and restore the world’s shark populations. According to FIU research, around 100 million sharks are killed every year. They are being illegally fished and their fins and meat illegally traded. Though sharks have survived on this planet for more than 400 million years, a quarter of all species are now threatened with extinction. Michael Heithaus understands this reality better than most. The dean of FIU’s College of Arts, Sciences & Education has dedicated his career to the great ocean predators. Before Chapman joined the team at FIU, he and Heithaus were already working together on Global FinPrint, an international project that is capturing sharks and rays on camera in their natural habitats. They are trying to identify the last remaining strongholds of sharks and rays around the world. The project has received core funding from Paul G. Allen, co-founder of Microsoft, and is part of FIU’s Tropical Conservation Institute. Global FinPrint’s data is providing desperately needed information to protect the sharks and rays that are left and to rebuild populations that are in trouble. Though he is a native of landlocked Ohio, Heithaus fell in love with the oceans as a child during annual holiday visits with his grandmother in Florida. While in college, he was introduced to Shark Bay, Australia, a place so remote that few people call it home. Its waters are relatively untouched and feature a vibrant tiger shark population. For 20 years, Heithaus, along with research scientists and students from his lab, has conducted one of the world’s most in-depth studies on sharks there. The team has answered critical questions about how sharks function, and how they help maintain healthy populations of other animals and even plants. His work in Shark Bay has revealed a critical piece of knowledge that has given rise to new conservation priorities and strategies worldwide — without sharks, the health of the world’s oceans would suffer greatly. People would too. Aside from serving as an important food source, healthy oceans also help mitigate climate change as seagrass beds absorb and store vast amounts of carbon dioxide. But seagrasses need sharks to balance the food chain. Heithaus is helping the world to understand that sharks are indispensable animals that need protection from people, not necessarily the other way around. For years, FIU scientists have been involved in establishing shark sanctuaries and marine protected areas. Their efforts have been instrumental in obtaining protections through international treaties. In 2016, FIU scientist Mark Bond was part of an international effort to have four shark species and nine mobula rays added to the CITES list of protected species. The October meeting was in Bond’s native country of South Africa. Just like Chapman, Bond planned for a career split between ocean and lab. He was not looking for a career in advocacy. In fact, before the 2016 CITES meeting, he didn’t own a single suit. He now has three hanging in his closet. But the researchers still find the greatest adventure in the open water, pursuing answers and solutions to the ocean’s great challenges. Advances in technology have created new methods for getting to the core of what’s plaguing particular species of predators. Many scientists use satellite tags to track the movements of sharks with the idea that if you know where they are, you can focus conservation efforts there. But FIU scientist Yannis Papastamatiou wants to know what drives a shark to do what it does and go where it goes. Known internationally for his work in predator physiology and behavior, the London native explores the secret lives of sharks. He uses a variety of different tracking tags that reveal details about a shark’s behavior and physiology as it swims freely through its environment. These include sensors that record swim speed, acceleration, direction, and even digestive processes. Video cameras attached to the sharks provide further information on where the animals are and what they are doing. He is collecting as much data as possible about shark behavior, hoping to add a whole new level of understanding — one that can help predict how distributions of sharks could change over time with climate change. Though he studies coastal and open ocean populations, Papastamatiou brings an added layer of adventure to FIU’s Marine Sciences Program by diving to deep depths and going where many others dare not. He also works with sawfish, a type of ray distinguished by a long extension of its nose and teeth resembling a saw. Perhaps one of the planet’s strangest creatures, all species of sawfish are listed as critically endangered or endangered. Papastamatiou is quick to point out that Florida represents the last stand for the sawfish in the United States, which is one reason he chose to come to FIU. But most of all, he was drawn to the idea of creating a marine predator research hub. Heithaus says the predator research hub came about fairly organically. Marine biologist Jeremy Kiszka joined Heithaus’ lab as a post-doctoral researcher in 2012 to focus on marine top-predator ecology. He has worked all over the world studying how fisheries and other human activities impact the ecosystems of these predators. Papastamatiou joined FIU in 2015. Bond signed on not long after. Recognizing the growing emphasis on predator biology and ecology at FIU, Chapman soon realized a predator hub was assembling, something he wanted to be a part of. He arrived in the fall of 2016. 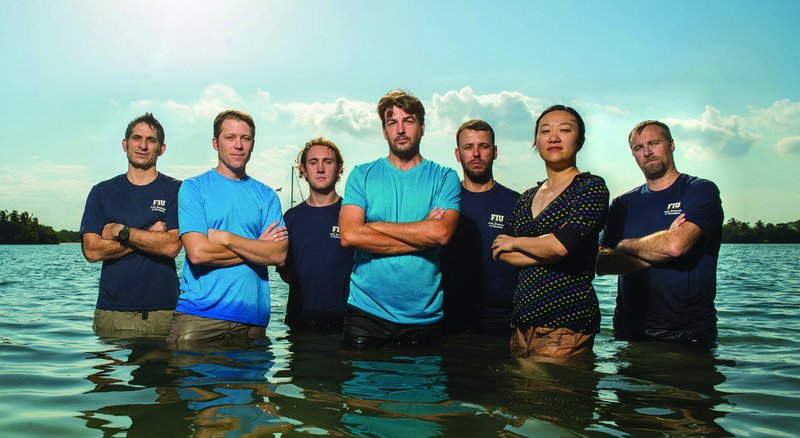 The team is joined by others in the Marine Sciences Program who are working in complementary areas including: Kevin Boswell, a fisheries and acoustics technology expert who works regularly with predators; and Yuying Zhang, a fisheries expert who is currently working on new methods of sampling for shark populations. Though each scientist brings unique areas of interest and expertise, they share several common attributes. They all started out as researchers but have found themselves evolving into advocates. They never run out of questions to pursue. And they all have a sense of adventure that is balanced by deep respect for the predators they work with. They are recognizable faces outside of the shark community. Papastamatiou, Heithaus and Chapman are regulars on Discovery Channel’s Shark Week. Heithaus also hosted a Critter Cam series on National Geographic and has authored several textbooks. Chapman gained international fame in 2007 with the discovery of the first documented virgin birth of a shark. He conducted DNA testing on a female hammerhead that mysteriously appeared in a tank occupied by three female sharks and determined the pup’s genetic makeup perfectly matched one of the adult females with no sign of a male parent. It wasn’t long before other cases of predator asexual reproduction were identified by Chapman. But saving the world’s sharks is at the heart of it all. Without sharks, the scientists would all be out of work. More importantly, the oceans and the planet would be in trouble.